Jean Lafitte, that flagless buccaneer who sealed Great Britain's fate in the Battle of New Orleans, is surely one of history's most romantic and enigmatic characters. Lord Byron was moved to write of him, "He left a corsair's name to other times/Linked one virtue to a thousand crimes." Even now, we do not know with certainly his date of birth (or death), his place of origin (or his final place of rest). He may have been born in Marseilles, or Bordeaux, or possibly Haiti. One chronicle, purportedly his personal journal, indicates that his trusted lieutenant, Dominique You, was actually Lafitte's brother. Yet another document contends his parents were French aristocrats who died under the guillotine. Most accounts agree on his appearance: he was a tall, handsome man with hazel eyes, black hair and, usually, a black mustache. In his glory days, he was called "The Gentleman Pirate" and "The terror of the Gulf," and he commanded an armada of fifty ships, and over 1000 privateers of various nationalities from his base on Grand Terre Island at the entrance to the great swamp of Barataria. Lafitte angrily denied he was a pirate. He flew the flag of Cartagena, the major port of Colombia then in rebellion against Spain. This was the legal pretext for plundering Spanish shipping and then selling the contraband to New Orleans merchants. Lafitte's men and ships were registered with the United States Customs and accounted for everything captured, to the last loaf of bread or piece of cheese. From the early years of the nineteenth century until well after the War of 1812 his Baratarians swarmed the Caribbean, plundering smuggling, and illegally transporting thousands of slaves. He was a citizen of the wind. There is no character in our literature to compare with him. He was not really a swashbuckler so much as he was a brilliant organizer, diplomat, and visionary. This "pirate" spoke four languages-French, Spanish, Italian, and English. His commune on Grand Terre included a cafe, bordello, gambling den, warehouses, and a barracoon (for detaining slaves). His outdoor bazaars offered incredible bargains in "imported" silks, spices, wines, and furniture. One customer, A. L. Lacour, wrote in 1816, "The most respectable inhabitants of the state purchased smuggled goods from J. Lafitte ... in Barataria." Barataria, a huge wetlands maze Lafitte called the "Back Door to New Orleans," was named after the Old French word Barataria, meaning "deception." The Gentleman Pirate organized a superb transportation system, widening waterways and digging canals. His gigantic barges, one hundred feet long, were hewn from raw cypress trunks and shuttled back and forth almost daily to New Orjeans, loaded with men and merchandise. Eventually, Jean Lafitte threatened to monopolize the city's import trade. New Orleans merchants goaded the new American governor, William C. C. Claiborne, into accusing him of piracy and posting a $500 reward. Lafitte made Claiborne a laughingstock with his own offer of $1500 for Claiborne's capture, and to rub it in he hired District Attorney John R. Grymes as his counselor (for a reported $10,000). Lafitte would not be bought, bribed, or intimidated. In 1814 the British offered him $30,000 and a Royal Navy commission to help them capture New Orleans. The buccaneer turned them down and informed Claiborne of his wish to become a citizen and to give Claiborne his support, if his Baratarians were pardoned for all past crimes. Claiborne was ready to relent when the American Navy swooped down on Grand Terre and destroyed it. Fortunately for the infant United States, Andrew Jackson sought out the buccaneer and agreed to honor his request. Most historians agree that, had it not been for Lafitte's powder and flints and some extraordinary bombardeering by Dominique You, Great Britain might have won the Battle of New Orleans that foggy morning of January 8, 1815. Jackson was true to his word. All Baratarians were granted citizenship. Many settled down on Grand Terre to fish and trap. But the restless Jean Lafitte moved on to another island fortress off what is now Galveston, Texas. His privateer haven was soon overrun by criminals and fugitives. His own men disregarded orders and resorted to flagrant acts of piracy. In September of 1819, the United States Navy captured eighteen of his cutthroats looting a Spanish ship. They were tried, convicted, and publicly hanged in New Orleans. 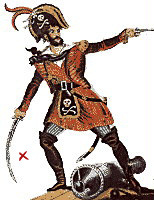 On May 11, 1821, Jean Lafitte put the torch to his island commune and sailed away into oblivion. Some say he fought with Bolivar to liberate South America. Others say he died with ten of his men fighting petty privateers off Isla Contoy, Yucatan. Still others place his death of fever on Isla Mujeres, a lonely embittered man of forty-seven. Today, Baratarians cherish the fantasy that the Gentleman Pirate is buried in an unmarked grave along the bayou that runs through the village of Lafitte. He rests, some say, next to the unmarked graves of Napoleon Bonaparte and John Paul Jones (but that's another story, or two). "Around here," say the natives, "Lafitte's buried in everybody's backyard." Jean Lafitte came from nowhere, took orders from no one, and, lacking a permanent place to land, disappeared. We can be sure of only one thing. For a few glorious hours on the field on Chalmette, he was a proud American. Reprinted by permission The New Orleans Tourism Marketing Corporation.